Who’s hanging about in your business? Whatever the nature of your business, the people within the building will include several ‘types’ of occupant. This may include staff, customers, visitors and service providers and possibly other people. So, do you know who’s on your premises and where they are at any given time? Maintaining the security of your business is as much about managing the risk when you’re open as when the building is closed and locked up for the night. In some ways, protecting it during opening hours is more of an unknown quantity than simply locking up and setting an alarm. Retail is an obvious one, with customers outnumbering staff many times over at peak times, but office or industrial buildings can also pose risks. 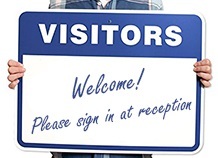 For example, how easy is it to slip through a rear loading door or can visitors access all parts of a building once they’ve been allowed through an initial reception area? To maintain good levels of security, as well as safety, it’s a good idea to have knowledge of who is on your premises and ensure that access to anywhere that could potentially be a target for theft is restricted. This is not always achievable and it does depend on the nature of your business eg you can never really know who the customers are in a retail shop but you can in an office building, but every business can take some actions to control the risk. Obviously you don’t want to treat your staff, visitors or customers with suspicion but most of these measures should only really impact on people who are in areas where they didn’t really ought to be. Knowing who is in the building at any time is also good practice for fire safety or any other kind of emergency evacuation. We can help with several of these areas including access control systems, CCTV and even door signage. Call us on 0345 833 5543 or send us a message.